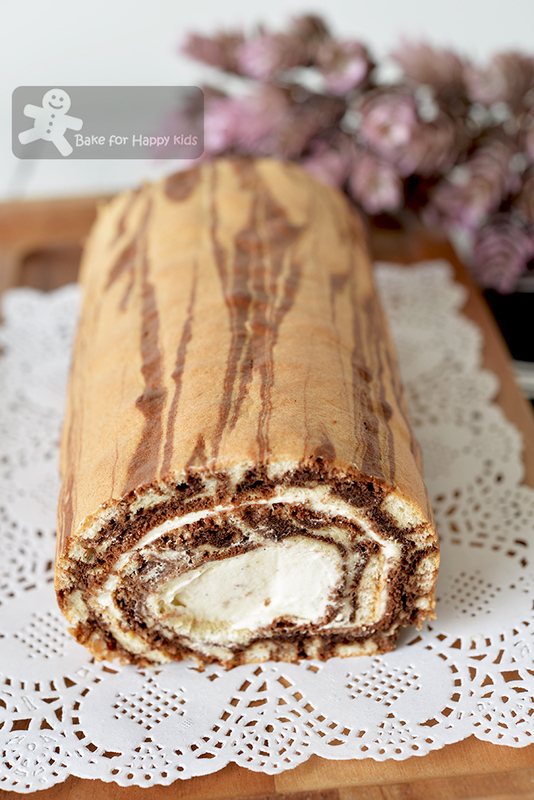 And this is why I had been marking around my favourite Cottony Soft Coffee Chiffon Swiss Roll recipe at here to bake this pretty Marble Mocha Chiffon Swiss Roll. 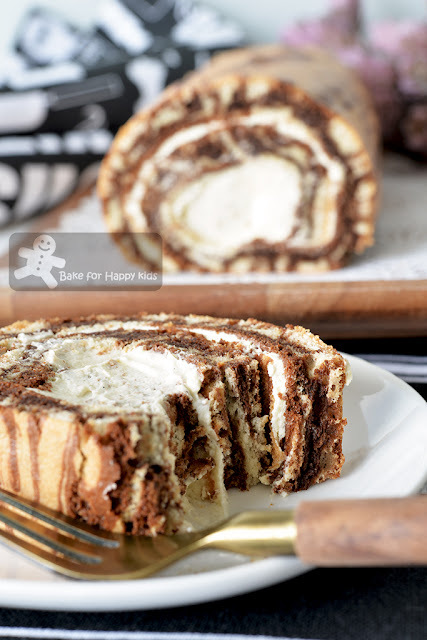 My Marble Mocha Chiffon Swiss Roll. Although I said at here that I'm done with baking Swiss rolls with hurricane motifs, I was wondering if I can bake Swiss rolls with other pretty motifs or designs and came out with this idea of creating a stripey marble Swiss roll rather than a patchy marble kind. Happy to see that every slice of my Swiss roll is made with this pretty marbled design. Not just pretty... 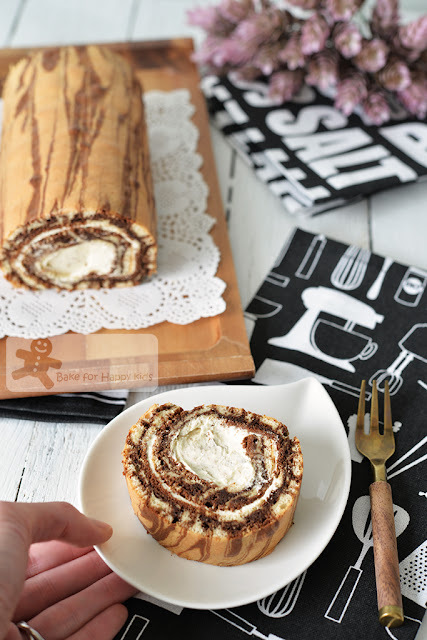 This marble mocha Swiss roll is delicious too. It is cottony soft and has a good mixture of creamy, chocolate, coffee and vanilla taste! Well, I can or can't say yes or no! LOL! Am I confused? Absolutely not. I'm saying this because I'm extra critical. Although the cake is light, soft, cottony, pretty and delicious, it is NOT as THICK and FLUFFY like my previous Coffee Chiffon Swiss Roll at here. Despite the fact that both recipes are 95% identical, the preparation of two separate batters and the additional piping step might have deflated the batter slightly, causing the cake to rise slightly lesser than usual. Having said that, this marbled Swiss is definitely looking prettier and more interesting than the plain-looking one. So in another words, I would highly recommend this recipe if I want to bake a pretty Swiss roll but won't recommend this recipe if I prefer to bake a fluffier Swiss roll... Tough decision huh? Nevertheless, I don't mind baking either cakes because both are nice anyway. Like my baking video and recipes? To get the latest updates from my blog, you can follow me at either my Facebook at here or here or my Instagram @zoebakeforhappykids. 35g egg yolks - about 2 large but please use exact weight. Note: I have used 150ml whipping cream and this amount is just right for me but if you like your Swiss roll to be filled with more whipped cream, you can increase the amount up to 250ml. I prefer to add NO SUGAR into the cream but you can add 1-2 tsp icing sugar into the cream before whipping it. While beating, proceed to mix the egg yolk mixtures. In another large mixing bowl, combine egg yolks, milk, oil and vanilla. Use a hand whisk to mix until combined. Sift cake flour, corn flour, baking powder and salt into egg yolk mixture and use a hand whisk to mix until all are well-incorporated. Set aside. In a large mixing bowl, combine coffee-milk mixture, egg yolks, oil and vanilla. Use a hand whisk to mix until combined. Sift cake flour, cocoa powder, baking powder and salt into egg yolk mixture and use a hand whisk to mix until all are well-incorporated. Set aside. Divide egg white mixtures (total weight is about 240g) equally into two portions (about 120g each) by weight. Using a hand whisk or a spatula, gently fold in one portion of egg white mixture to the vanilla egg yolk mixture and another into the cocoa coffee egg yolk mixture in 3-4 batches. It is ok to mix the 1st batch of egg white more vigorously into the egg yolk mixture but the subsequent portions must be folded in very gently. Make sure that most of the white is not visible after folding. Transfer both vanilla and cocoa coffee batters into two large piping bags. Pipe 4 lines of vanilla batter along the short side of the prepared baking tray with equal spaces in-between the piped batter. Then, pipe 4 lines of cocoa coffee batter along the short side of the prepared baking tray on top of the vanilla batter. Repeat these piping of vanilla batter and cocoa coffee batter steps until all of the batters have been piped onto the baking tray. The batter will slowly spread out from their piped area to form nice alternate vanilla and cocoa design. Start from one corner of the pan, use a thick chopstick to draw multiple (about 25-35) lines from left to right, up-and-down along the short side of the tray, leaving about 0.5 to 1 cm in-between two lines. Bake for 16-17 mins or until the cake is well-risen and fully cooked. Place cake with the skin side down on a clean baking paper. Use a knife to trim off about 0.5 cm from both the shorter sides of the cake.